Now Available from Trafford books! Woody Wodraska’s 40-year gardening career has taken him to 17 gardens and another dozen agricultural endeavors in almost as many states and provinces. Always the questions arose—how to grow food, how to live in beauty and abundance with grace and in harmony and in co-creation with Devas and Nature Spirits. 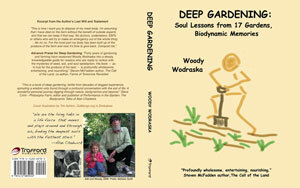 From backyard family gardens to a CSA enterprise feeding 100 families, Woody started from scratch or built on other gardeners’ vision.